A bronze DofE programme has four sections, volunteering, physical, skills and expedition. You need to be at least 14 years old to start a bronze programme and you must do a minimum of three months activity for each of the volunteering, physical and skills sections, and plan, train for and do a two day (one night) expedition. The next step up from bronze... you need to be at least fifteen to start doing your silver DofE programme. 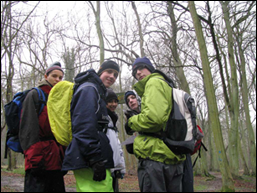 A silver DofE programme has four sections, volunteering, physical, skills and expedition. You need to do at least six months volunteering and a minimum of six months on either physical or skills and three months on the other. It's up to you which one you do for longer. The expedition section involves planning, training for and doing a threeday (two night) expedition. Once you hit sixteen you can do your gold DofE programme. You'll spend twelve months on your volunteering section. For physical and skills you must spend tweleve months on one and six months on the other - you decide which way round you do it. The big difference at gold, is you'll also do a residential section - staying away from home for five days and four nights doing a shared activity with people you don't know. It's great fun and a real chance to do something different!